Review by AllTheBestFights.com: 2016-12-03, close fight with some nice exchanges: Joseph Benavidez vs Henry Cejudo gets three stars. Joseph Benavidez entered this fight with a pro mma record of 24-4-0 (62% finishing rate) and he is ranked as the No.2 flyweight in the world. He suffered his last loss when he faced #1 Demetrious Johnson in their rematch in 2013 (=Johnson vs Benavidez 2), since then he has won five consecutive bouts beating Ali Bagautinov (=Benavidez vs Bagautinov) and Zach Makovsky in his last two (=Benavidez vs Makovsky). His opponent, the 2008 Olympic freestyle wrestling gold medalist Henry Cejudo, has a record of 10-1-0 (40% finishing rate) and he entered as the No.4 in the same weight class. He has fought once in 2016 losing to Demetrious Johnson (=Johnson vs Cejudo). 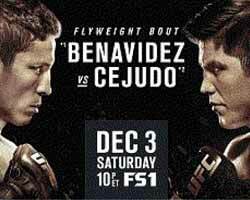 Benavidez vs Cejudo is on the undercard of Demetrious Johnson vs Tim Elliott – UFC Tuf 24 Finale. Watch the video and rate this fight!